Go on – admit it, who doesn’t enjoy a good peek ‘behind the scenes’ at the contents of someone else’s wardrobe? 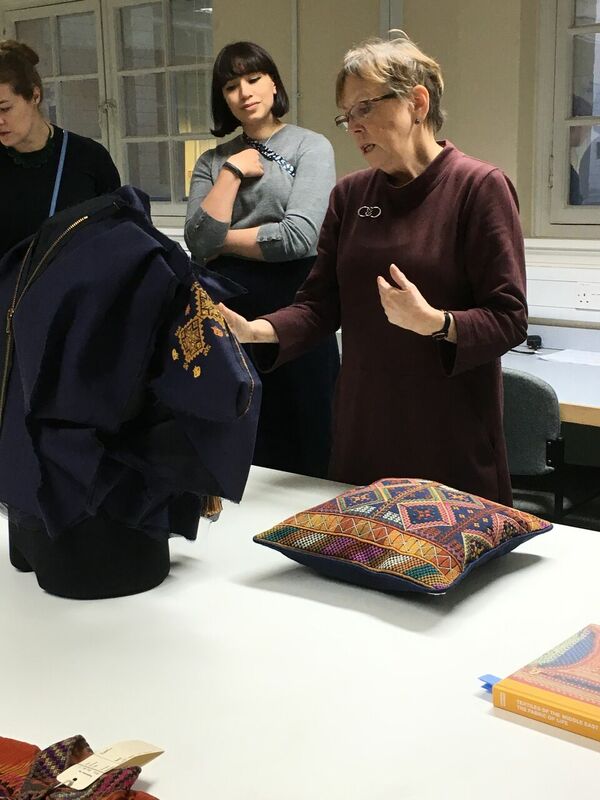 Organized by The Costume Society, this half-day event was an opportunity to have a look ‘behind the scenes’ at the Clothworkers Centre, in the company of curators from the V&A and British Museum. First up was a visit to the store of the British Museum textile collection where Helen Wolfe, Collections Manager of Textiles, showed some stunning examples of embroidered costume from Southern Palestine. This included a richly embroidered wedding outfit from the early 1900s consisting of bonnet, scarf, dress, and bolero style jacket. A recent example of modern costume embroidered by women in refugee camps in Lebanon was the perfect example of how historic collections can, and do, inform contemporary textile practice. Helen referred to plans for the new Islamic Galleries due to open at the British Museum in October and answered many questions about the storage and handling of historic textiles. Then, a short walk through the stores (ooh! - so many distractions, so many lovely rows of neatly stored textiles) and downstairs to meet Edwina Ehrman, Senior Exhibition Curator with the V&A. Edwina had chosen to show the group a number of costume items that had been under consideration for inclusion in the forthcoming ‘Fashioned From Nature’ exhibition but hadn’t made the final cut. It was fascinating to hear Edwina talk about the background to the planning of the exhibition and to study the objects on the table at first hand. If I wasn’t already looking forward to the new exhibition, I was certainly intrigued after this presentation. Ruby Hodgson, Assistant Curator at The V&A provided a very exciting finale to the afternoon by walking, and talking, the group through the V&A costume and textiles stores, answering questions along the way. When she opened a deep storage drawer to reveal a magnificent Norman Hartnell dress made for a state visit to France by the Queen in 1957, there were audible gasps from everyone but Ruby had an even more staggering piece to show. Removing the covers from an elaborately embroidered 1740s dress of Spitalfields silk, she ended the afternoon in fine style. I loved the whole experience and would strongly recommend any similar costume study days. Helen, Edwina and Ruby were extremely generous with their time and expertise and provided an invaluable insight not only into costume history but also museum practice and exhibition planning. A big thank you to all of them, and to the organizers of the event.